Canton DM 50 review | What Hi-Fi? Hugely thrilling sound and a beautiful design. Still our favourite soundbase. We loved the Canton DM 50 when we first reviewed it, and the months since haven't reduced our affection in the slightest. It sounds gorgeous, it looks great, and we reckon £400 is a small price to pay for the huge boost in TV sound quality it delivers. 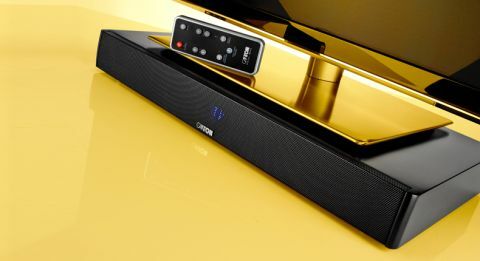 The DM 50 is exactly how we want a soundbase to sound. The velvety rich detail, rumbling bass performance and clear, open highs draw you in immediately. Whether you’re watching the nail-biting Wimbledon final or wearing down your Blu-ray of The Lego Movie (it’s awesome), the Canton immerses you in the action with a superb amount of insight and punch. The presentation is full of soaring dynamics and there are layers of detail. It’s the most dynamically subtle soundbase we’ve heard so far, too, with more depth and insight than the rival Cambridge Audio Minx TV. The deep bass rumbles with warmth and aggression, lending satisfying weight to punches and explosions while also being agile, taut and spirited when streaming heavy blues tunes from Spotify. Voices sound natural, with emotions and inflections easily conveyed thanks to the Canton’s subtle touch and smooth integration across the frequencies. The top end never hardens even as sound effects take on an attacking mode, and the muscular bass never gets out of shape. It’s a well balanced, cohesive and exciting performance that lends itself well to music as well as movies. You can twiddle with bass and treble levels, but we felt no need to upset the Canton’s naturally well-behaved balance. The two sound modes are worth a play, though. Stereo mode keeps everything in sharp focus, with a close-knit presentation. Surround mode opens up the soundfield, but it doesn’t compromise the midrange or vocal clarity too much. Try it when watching Blu-rays for a more cinematic experience. Elegant and impeccably finished, the Canton DM 50 is a minimal yet luxuriously built box. The Sony HT-XT1 may catch the eye with its sleek glass top, but the Canton’s semi-gloss finish (in black, white or silver) is classy. It’s a fairly compact unit, but the DM 50 will easily bear any TV of up to 40kg. Single optical and coaxial inputs and a pair of phono connectors are all the connections you get on the Canton DM 50. It’s adequate enough for a direct connection to your TV (optical connection is our favourite method), but we would have liked a better breadth of connections – such as HDMI inputs. Bluetooth streaming is on board, as mentioned before, with the aptX codec support that boosts the streaming quality from your smart device. The Canton’s front panel has a blindingly bright blue LED display that indicates all the basic and important information, such as the selected input, the volume level, and which sound mode you’re turning on. You can also control the bass and treble levels. It’s worth playing around with this feature, as you can fine-tune the sound to your liking. We toned down the bass just a touch, but left the treble alone. All of this can be adjusted from a nicely made, big chunk of remote control. Unlike the small, flimsy flat remotes that are supplied with most rival soundbases (the Cambridge Audio Minx TV and Orbitsound SB60 are the worst offenders), the Canton’s is solid and reassuringly hefty. The buttons are large and laid out neatly, and are responsive and easy to use. It’ll take one hell of a soundbase to better the Canton DM 50. The power, detail and sheer enthusiasm in its performance keeps us permanently glued to whatever we’re watching, and it sets a high standard for the competition.